MY GOD! WHAT HAVE I DONE!? 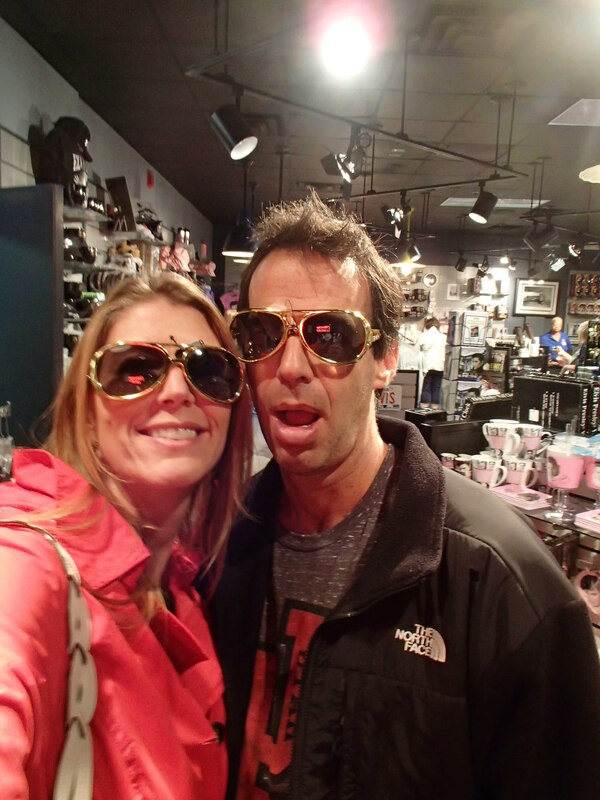 This is not my beautiful wife…wearing Elvis glasses in the Elvis gift shop at Graceland…just one of the stops on our year-long tour. And in case you are indifferent to Elvis and have never been to Graceland (like we were), you should go!! We loved it and highly recommend it!! Although we have embarked on a great “once in a lifetime” adventure, some aspects of it are far from the beautiful life and house we had before. Not that we’re complaining, but such an adventure requires some adjustments. Fortunately, we both have a spirit for adventure and welcome change and new experiences. The thermostat has issues. It has been replaced once, but needs replacement again. Don’t try and set the temperature in zone 2. Just don’t. First and foremost, the biggest change is that we are driving our house! Picture, if you will, what life would be like if every time you needed to have your car worked on, you had no place to live. That is truly the essence of full-time RVing: you do whatever you can to avoid having to get your vehicle serviced. Self sufficiency and industriousness are key ingredients of successful RV life. When we left our home, we packed a small bag of what we thought would be essential tools – hammers, screwdrivers, allen wrenches, measuring tape, drill, wire cutters, pliers, etc. We also brought useful items like Velcro strips, duct tape, flashlights, and cable ties. These have come in handy already in numerous ways. Also some tools I threw in just for kicks have become essential – like a crimping tool and a digital multimeter, which have impressed many a customer service representative. It’s amazing even to me, an electrical engineer, how much of the RV subsystems are managed ultimately by electronics. However, I quickly had to purchase numerous items I didn’t envision needing, such as a wide variety of fuses, square allen wrenches, metal-piercing drill bits, a wire hacksaw, and a crow bar. 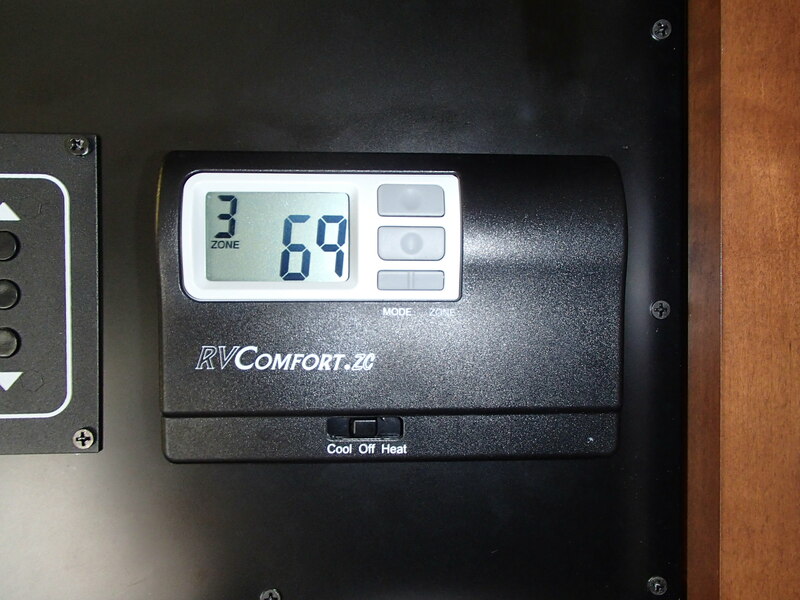 We have become very resourceful and have learned a great deal about the inner workings of our RV, including the HVAC, plumbing, electrical systems, and uncountable other sub-components. A chipped window from a rock on the road. Just one of many issues we’d like to address if only we had the time. I can see up your skirt! 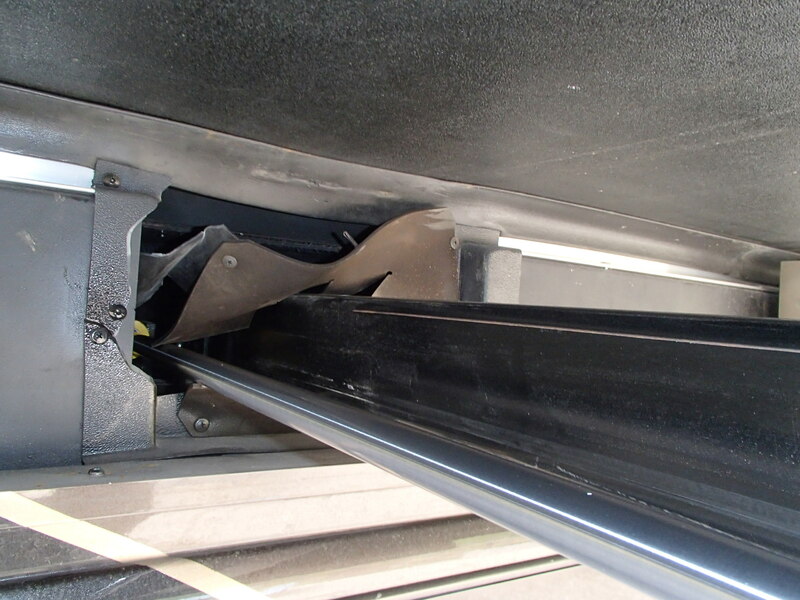 The skirting around the underneath support structure of the slides is covered under warranty. Replacing it is on the list (a gigantic spreadsheet), but it’s the least of our problems. In the two plus months that we’ve been on the road, despite the 15 pounds of manuals onboard, we’ve had to call most of these companies several times: Thor (RV maker), Freightliner (chassis), RVComfort (HVAC thermostat), RVIBrake (auxiliary braking system for tow vehicle), Winegard (mobile satellite management), DirecTV (obvi, right? ), Jensen (sound and navigation system), True Induction (stove top), and TriMark (keyless entry/security system). Numerous other problems merely required consulting the owner’s manuals: Magnum (energy management), AquaHot (water heater), Fisher & Paykel (dishwasher), Dimplex (fireplace) and I’ve had to open and study every one of the five fuse boxes in the vehicle. In our sack-full-o’-manuals, only five of them have we not yet had to peruse. Quality kudos go to Cummings (engine), Allison (transmission), Thetford (toilets) – three big thumbs up and “phews” there – as well as Whirlpool (washer and dryer) and Kwikee (electric steps). 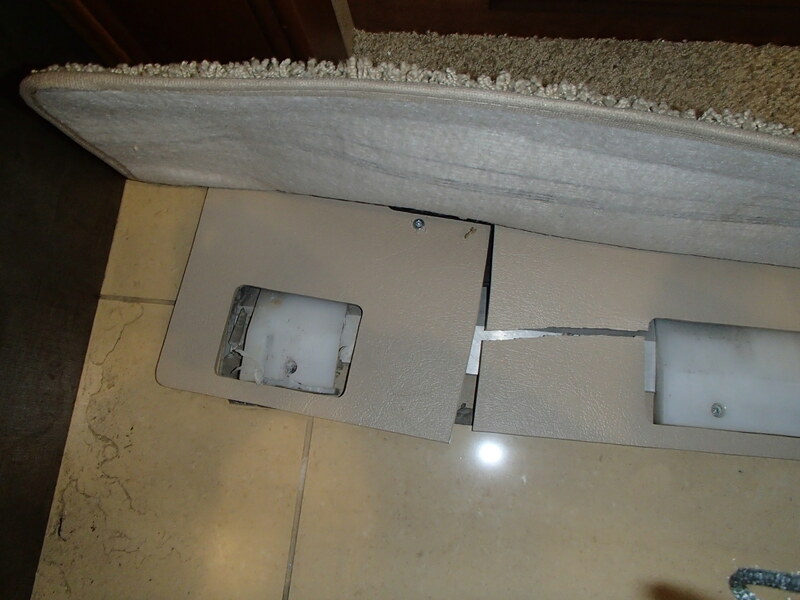 This broken plastic support frame under the carpet in the bedroom is what enables the slides to move in and out without bunching up the carpet. This is the kind of thing that duct tape can help with until it’s fixed (which is has been, thanks to Las Vegas Camping World RV Service). The next lesson of life on the road has been allocating time to make all the phone calls necessary to understand why something has failed and how to fix it, and then allocating additional time to fix it. I have found that early mornings are often the best time for these endeavors; people seem easier to reach and they are more likely to return your call that day. Mornings have also become my project and repair time. In the early days of our travel, almost every morning was devoted to either a repair project or multiple problem diagnoses with the help of telephone support staff. A few people now recognize my name when I call, and a couple even have given me their personal cell phone numbers to call them directly. I seriously can’t imagine how someone who isn’t reasonably handy and intelligent could maintain an RV, even a new one. I imagine that owners must simply let things break and not repair things that aren’t mission critical. Indeed, considering my experiences renting RVs in the past – that is EXACTLY what they do! Being a Type A perfectionist might be a detriment to my sanity in this new RV life, but from a maintenance standpoint, it keeps me ahead of the curve on repairs, and behold, the list of problems is not increasing as rapidly as it used to! Our first list of repair issues totaled 24 after just one night in the RV. The second list, compiled over the next 5 weeks (including several weeks when the RV was sitting idle), totaled 28 items. In the next 6 weeks, we’ve only added another 12 items to the list. Looks like progress! As far as lifestyle, it’s hard to find time to do things that used to be routine. Arriving in new places so often, we are excited to get out and explore. It feels like being on an extended vacation to endless new destinations (except we do have to work!). One of the big adjustments we had to make was to pace ourselves. When we first mapped out our itinerary, we planned to do everything we wanted within a year. We quickly realized we didn’t have enough time for exploring AND taking care of business. We had to reluctantly decide to skip certain places and events entirely. Even so, we clearly cannot do it all in one year, or even 18 months. As a result, we are seriously considering extending our travels for two or three years. Exploring and exercising at the same time, yay! In mid-October, we explored the Grand Mesa National Forest near Grand Junction, Colorado, and found the season’s first snow. While we have scheduled more time to take care of business without missing the sights, it’s still challenging to find time for things like exercise, reading, and catching up with distant family and friends. In just over 2 months, we drove 11,000 miles, which amounts to roughly 30 hours per week. That’s like a six-hour commute to work and back five days a week. Granted, this commute time includes sightseeing and getting to fun destinations, but we hadn’t considered how it eats away our days. Some days, we manage to have a short travel day and can get to our next destination early enough to explore nearby, like on this day in October. We drove two hours from Moab, Utah, to Fruita, Colorado, and went a mile down the road to explore and hike the Colorado National Monument. We always try to get those 10,000 steps on the Fitbit every day. 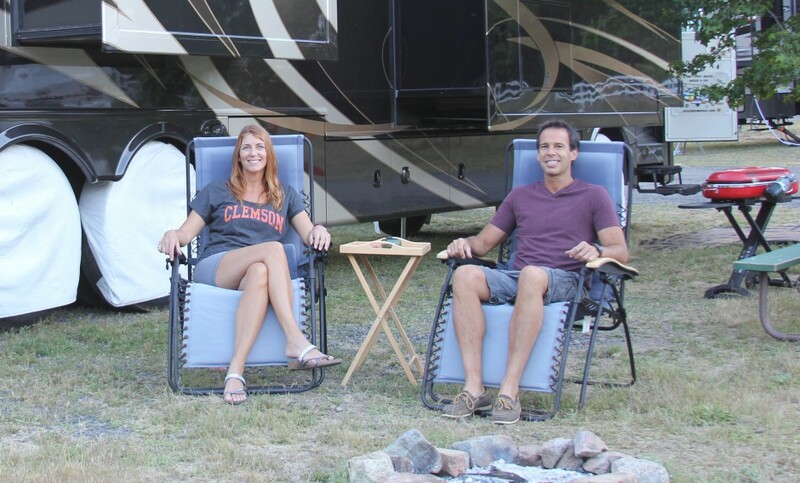 RVing can be a sedentary life style. We don’t belong to gyms anymore, so regular exercise becomes more challenging. To combat this, we try to walk or run every day, and we bought a set of variable weight Bowflex dumbells. They don’t take up much space (very important in an RV) and can be adjusted so that the user is lifting from 5 to 52.5 pounds each. Fortunately, neither of us watched very much television prior to RV life so that hasn’t changed, which keeps us from spending even more time sitting down. Planning healthy meals can also be a challenge due to the limits in our kitchen of a two-burner stovetop and a small microwave/convection oven combo. We find ourselves eating out more than we used to because we are often getting together with long-lost friends or family members. Even when it is just the two of us, our desire to experience the local cuisine and nightlife of the places we visit drives us to eat out. Getting enough exercise and eating right are even more challenging than before. One final and particularly difficult adjustment is the fact that RVers as a whole seem to be morning people – and we definitely are not! RV parks have check-out times similar to hotels, meaning your rig must be buttoned up and on the road by 11AM, typically. We learned the hard way our first week of travel that driving the RV after dark is a scary and risky undertaking, so now as a rule we are docked by dusk. That means it’s tough to do any exploring or sightseeing on travel days. Additionally, quiet hours at RV parks are typically from 10PM to 7AM. We would love to see a two hour shift on these hours, but alas, we appear to be in the minority. To our dismay, we found some RV parks even lock the gates at 10PM so you’re locked in (or out!) until the next morning! Oh, yeah. This is what it’s all about. 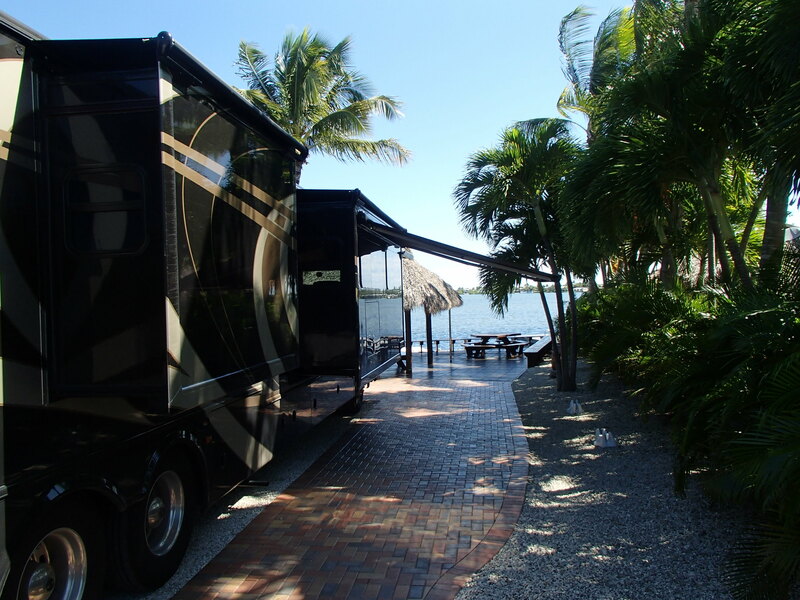 The RV park to spoil our opinion of all RV parks: Bluewater Key (near Key West, FL). Our own tiki-covered outdoor space, private dock, and warm waters. It’s a beautiful life! Despite the challenges and misalignments with some of our personal routines, we love the RV life! I call it living like a turtle – you take your home with you wherever you go. Hopefully the RV life will love us back: the problems with our rig will diminish and we’ll figure out more efficient ways to balance work, driving, exploring, eating well, and exercising. It’s certainly a big adjustment from the life we used to live, but we are reveling in the opportunity and are motivated to adjust our lives to find the right balance. RV life definitely is not the “same as it ever was…same as it ever was.” But this *is* our beautiful life! Want to read our adventures from the beginning? Start here. Want some more perspective on our story? See our About Us page. Nice capture of your life on the road for the last 3 months. I don’t think I could handle it as well as you two. Thanks, everyone! It has been a huge adventure and every day brings something new and interesting. We miss our New England friends too and hope you will come meet us on the fly somewhere soon! Great post; thanks for sharing. Really helps put RV life in perspective, and educates us non RV-ers in the ins and outs of RV ownership and maintenance. Miss you guys! Oh my gosh I relate to everything you wrote! Especially the part about driving your home – that was hard for me I think, because if something happens to your home you have to drive it somewhere to get it fixed! 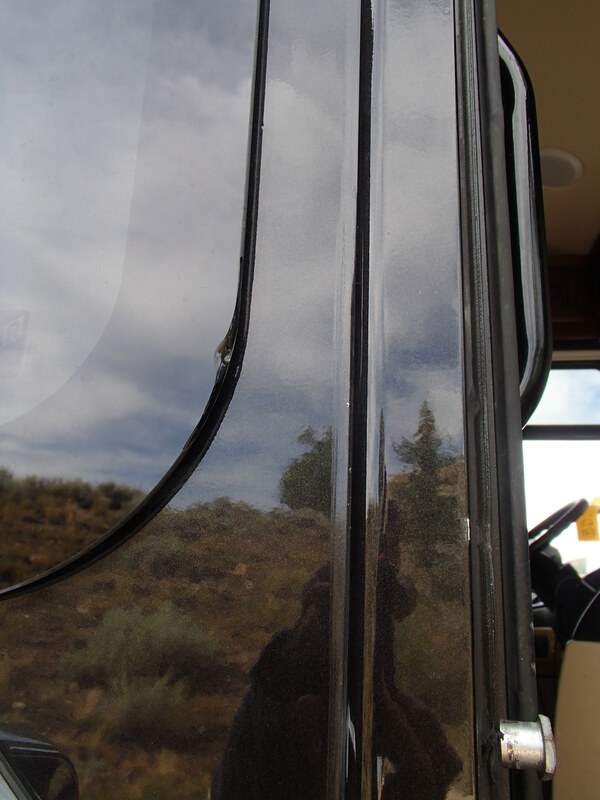 You feel more exposed….We had a brand new Nexus RV and we loved it but we did have a lot of problems – more related to component parts like the slide and levelers, not so much the RV itself. That was challenging. We were on the road FT for a year. 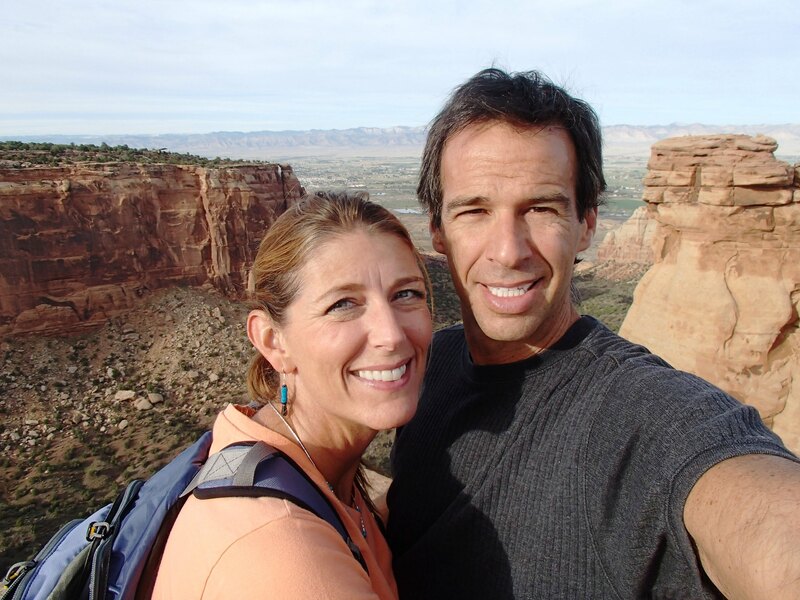 I missed having a home, so we are off the road now but looking for our next RV…..It was the best year of my life and also the most challenging – but even that was good because it challenges you in ways you need to know about! I feel like I found myself on the road. …I’ve added your blog to our link list at the blog for our new book, Tips for New RVers: Catchin’ the Dream. Wondering it you would take a look. We are looking for nice folks to help us promote the book – it’s for Newbies, inexperienced and wanna-be RVers. In any case, wishing you Happy Trails and many wonderful adventures. Hi Melissa, Thanks for reading our blog and for your note! 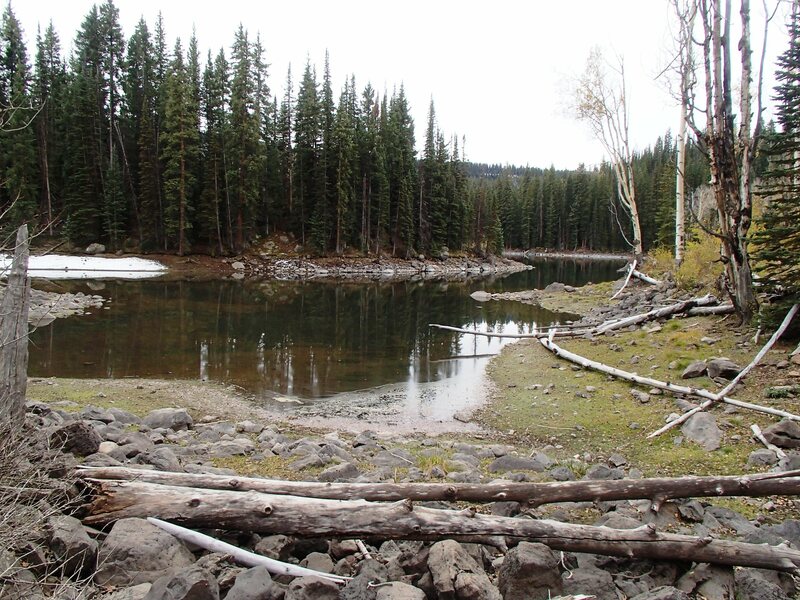 I found your book at http://www.amazon.com/Tips-New-RVers-Catchin-Dream-ebook/dp/B00PBFS9AW. Looks like something I could relate to! It’s on my wish list for Christmas, or I’ll buy it myself the first moment I have time to finish the books I already have on my kindle, lol!